After the Royal Navy withdrew from Rosyth and the Naval Base church was closed in January 1996, our then Minister, the Rev Malcolm Trew, invited the congregation of St Margaret’s Anglican Church to share the facilities of Rosyth Methodist Church. The St Margaret’s congregation was later accepted into the Scottish Episcopal Church as a dependent congregation under the Rector of Holy Trinity, Dunfermline. The two congregations worshipped separately, except on the 4th Sunday of the month, when both congregations united in a joint communion service, conducted by the Methodist minister. After a few years of sharing our buildings, both churches were keen to develop closer links. What was then called a Local Ecumenical Project (LEP) was discussed, which met with the approval of the then Superintendent of the Methodist Circuit and the then Bishop of the Episcopal Church. The LEP – now known as a Local Ecumenical Partnership – was initiated, a constitution agreed and a Covenant signed on 14 June 2000. Our partnership has flourished. It bears evident witness to our life together in Christ and we have honoured and fulfilled the Covenant as best we can. 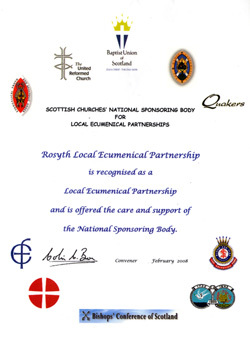 The second triennial review was completed in November 2007 in conjunction with the Scottish Churches’ National Sponsoring Body for Local Ecumenical Partnerships. At Pentecost 2010 (23 May) we celebrated the 10th Anniversary of our LEP with a joint Agape meal at which the Rev Lindsey Sanderson, secretary to the Sponsoring Body for LEPs read the Covenant document, followed by a period of silence for reflection. The service sheet is at this link, and a report, with reflections and other inputs, is at this link: both open in new tabs. We are responsible for keeping the fabric and property of the church and other buildings in good working condition. The Episcopal congregation has a Licence Agreement with us for the use of the buildings, which is reviewed annually, and they are represented on our Property Committee and involved in all decision-making. St Margaret’s provide financial support for the church on a monthly basis. We worship ecumenically, as well as following our own traditions, hold twice-yearly joint Vestry and Council meetings, and participate in social, fund-raising and group activities. The Rector of St Margaret’s is an Associate Minister of the Edinburgh and Forth Circuit. Information is shared between two fellowships by using a common weekly bulletin, and by the wider circulation of “Contact”, a partnership newsletter produced 6 times each year, and which is archived at this link.